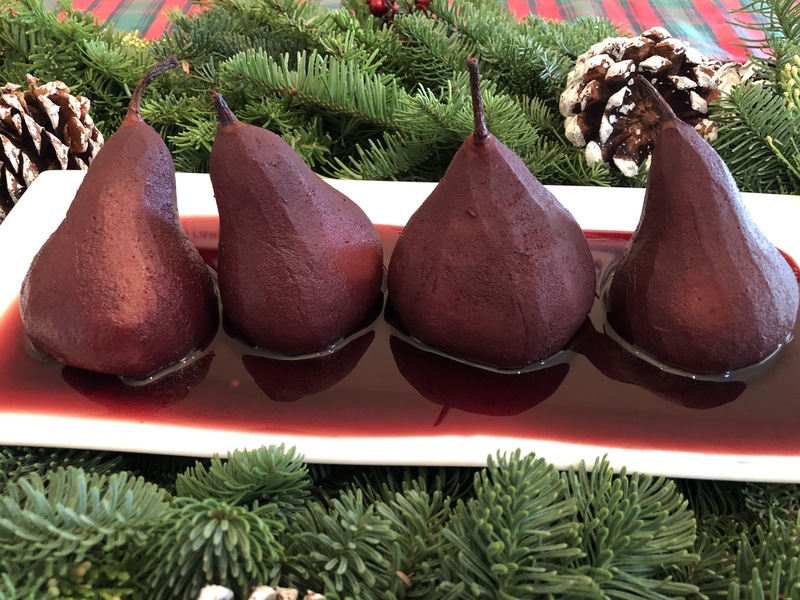 Pears have this seductive quality about them. They flaunt their curvy hips and hold their stem high, like wearing a tiny crown. Their taste and texture, soft, sweet and flowery, almost melts in your mouth. Rustic, yet delicate describe the Bosc variety, my favorite for poaching and making tarts. They hold their shape and don’t disintigrate into mush. A brown, weathered-looking skin, like years of overdoing a suntan, distinguishes them from the rest of their pear family. 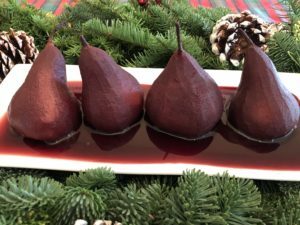 During the winter, I make wine poached pears and serve them after a hearty meal to bring a lightness to dessert. Deep burgundy sings of the holidays and is a show-stopper with little effort and can be made ahead. Dust them with powered sugar to give them a festive feel. 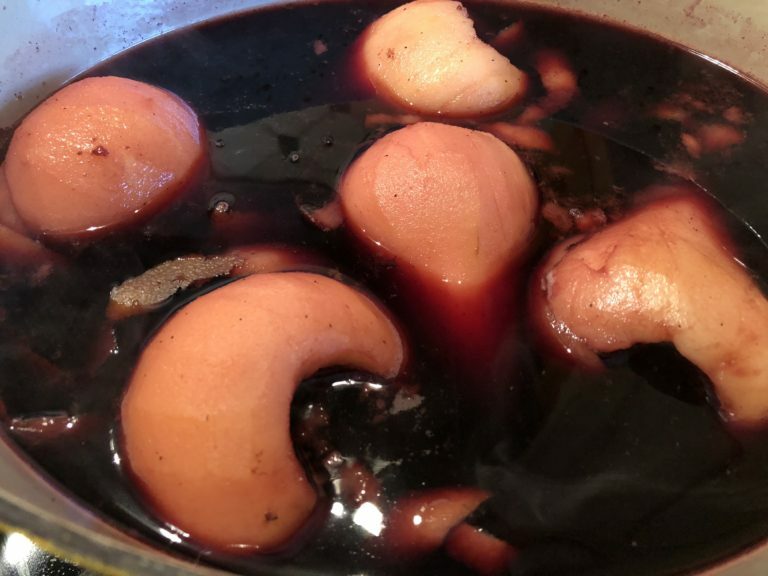 The leftover wine can be used to make Glugg, a Swedish hot wine drink, perfect for sipping beside the fire. Combine all ingredients in a large saucepan and bring to a boil. Reduce to low and simmer 45 minutes to one hour. This helps create the spicy infusion of flavors. 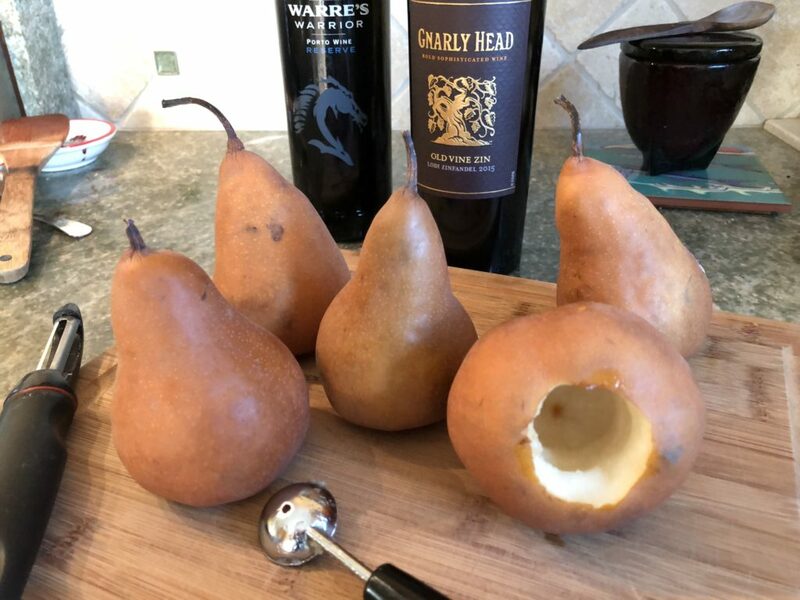 Core the pears by using a knife to cut out the bottom of the pear, then scoop out the seeds with a melon baller. 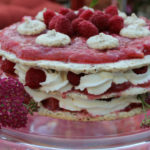 I carve a larger than usual cave to make room for the mascarpone and amaretti mixture, a surprise treat inside. Peel the pears starting from the stem, and down toward the bottom. This keeps the shape of the pears. Slip each pear into the simmering wine and poach for approximately 45 minutes to one hour. I use a deep wooden spoon or ladle to baste the pears every 15 minutes or so. A metal spoon might cut the delicate fruit. Gently flip them several times so their burgundy color is even. Cool in the pot, preferably overnight. Mix together the mascarpone and amaretti cookies. Stir in the almond extract. 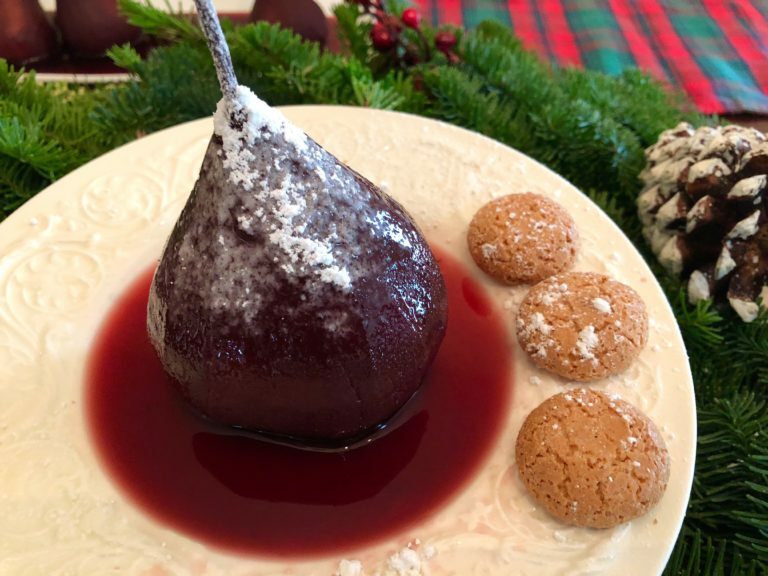 I like to have a few bites of cookie when I eat it with the pear, so don’t pulverize the amaretti. 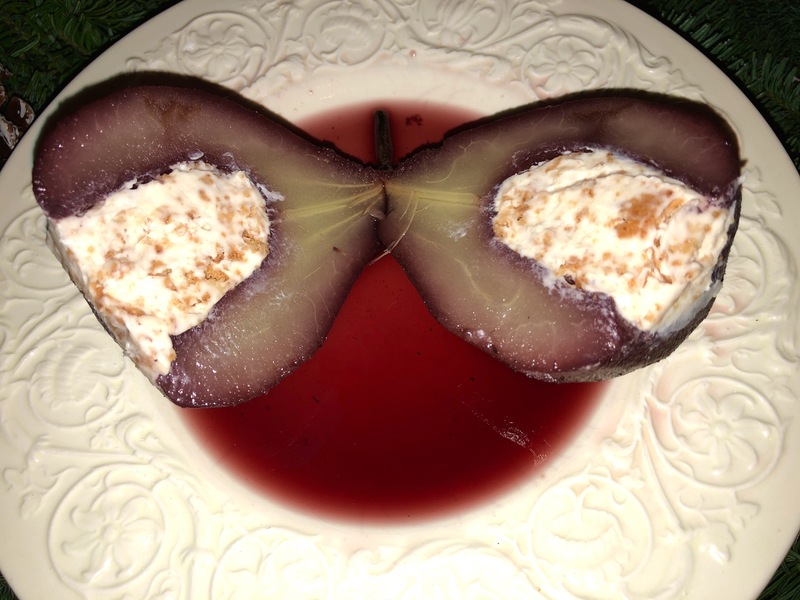 Gently stuff the bottom of the pears with the filling and set upright on a platter. Pour a little of the poaching liquid onto the bottom of the platter. Dust with powered sugar and wait for the applause.